It’s the most wonderful time of the year! Count down to Christmas in the best way with an adult beer advent calendar! 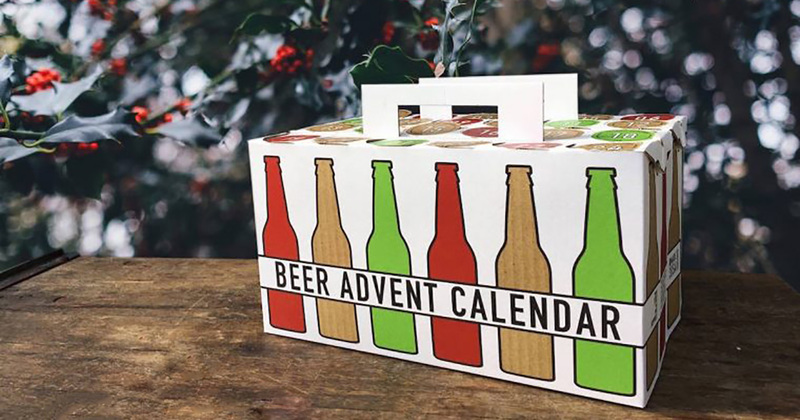 Have a beer a day until Christmas with these beer advent calendars. From German Beer Advent Calendars to locally made craft beer calendars, we’ve created a list of where to get Beer Christmas Calendars worldwide! The Craft BeerAdvent Calendar is always a popular one and sells out fast! As usual, the identities of the beers will remain a secret. Behind each removable window you will find 24 unique, hand-picked, quality crafted beers. Within this craft pack, expect to get your hands on some strong ales, imperial stouts, porters, bitters, blonde ales and many more. Visit craftbeerimports.ca for more information. 24 different craft beers, from 24 different craft breweries will be gathered from across Ontario. There are two options to choose from. These will be a mix of regular and limited release Ontario Craft Beers. They will packaged in a custom box with a perforated numbered top to keep each day a surprise. Just in time to celebrate the holiday festivities, Central City Brewers & Distillers and Parallel 49 Brewing Company have collaborated on an advent beer calendar with this year’s “Alpine Adventure” 24-Pack Beer Advent Calendar. Packaged to look like a festive gift, this year’s beer advent calendar features 24 seasonal favourites and brand new beers exclusive to the 24-Pack beer advent calendar. Christmas is coming early to Costco with the arrival of the 2018 Brewer’s German Beer Advent calendar. The 2018 Brewer’s Advent Calendar is a boxed set of 24 German different beers available in either cans or bottles. It’s Christmas in the Maritimes! The Maritime Craft Beer Advent Box contains 22 craft beers and ciders from 22 different brewers and distillers across the Maritimes! And to add to the Christmas cheer, 1 in 10 boxes contains a $50 gift card to Clearwater Seafoods! Get yours today! The BoozeBud Advent Calendar contains a sample of 25 craft beers (10 exclusive, never before seen beers!). The Beer Advent Calendar contains a mix of Pale Ales, IPAs, Lagers, Sours and Session Ales in bottles and cans. Sorry, dark beer lovers. There are no dark beers included in this Beer Advent Calendar. The Beerwulf Taverne Beer Advent Calendar features 24 craft beers from 24 craft breweries: with each day comes a new door to open and a special new craft beer bottle or can waiting to be enjoyed with friends and family. The UK Beer Hawk Advent Calendar features 24 craft beers from breweries from around the world. The beer calendar also features 5 exclusive beers that are made specially for the calendar and 4 UK exclusive beers! The Beer Cartel Beer Advent Calendar contains 25 beers 100% from 25 different independently owned craft breweries. The Australian beer advent calendar also contains 7 exclusive beers brewed specially for this advent calendar. OOPS! Did we miss something? Did we miss an Advent Calendar or Retailer? Reach out to us and we will add it to this list! We loved this Tooheys Extra Dry commercial, so much we had to share! Oh, let it rain!! !